Asus has announced that it is bringing USB 3.0 to its motherboards, with the Xtreme P7P55D-E Series given on-board support. SuperSpeed USB 3.0 is still in its early stages, but the technology is beginning to make its debut on devices across the computer world. 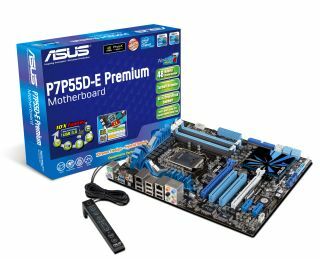 The high end boards are based around the Intel P55 chipset, support LGA 1156 socket Core i7 and Core i5 processors from Intel and have Asus' Hybrid technology. In Asus' words: "ASUS' unique expansion bridge design fully unleashes USB 3.0 and SATA 6Gb/s transfer rates for both the P7P55D-E Series and the U3S6 expansion card. "This specially-designed onboard IC doubles the bandwidth of the PCIe interface from Gen 1 to Gen 2, delivering ten times faster USB 3.0 throughput compared to the previous USB 2.0 standard. "Additionally, by eliminating transmission bottlenecks, the expansion bridge increases hard disk read and write speeds by up to 50%. Transferring a 20GB HD movie now takes less than 70 seconds, while a 4MB song requires less than 0.01sec. "Similarly, by inserting the ASUS U3S6 PCIe x4 expansion card into P7P55D Series motherboards, users can achieve the same rapid throughput with the latest USB 3.0 devices and SATA hard disks."